Last Thursday we had a great time at the Science Centre in Glasgow. We were able to explore the three levels taking part in puzzles, games and activities. Additionally, we took part in an amazing marvellous materials lab. 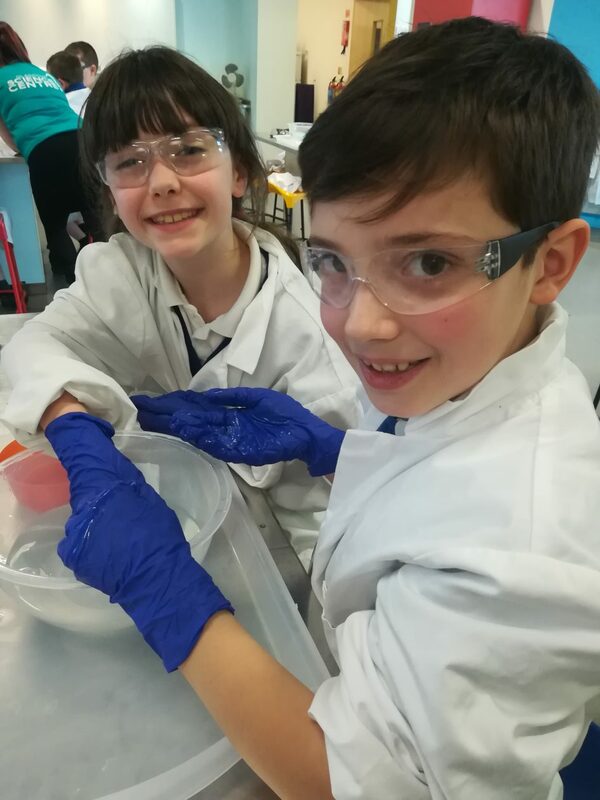 The children were able to find out about hydrophilic and hydrophobic materials, they were able to create an edible water bottle from combining two substances causing a chemical reaction and they also got the chance to look at how different materials absorb water and what use this could have in the current environment. It was a fantastic! A massive thank you to all the parents who offered to help and to those who were there on the day. This week in P4W we have been working hard being scientists. We are really enjoying learning all about water, its different forms and what we can do with it. We were lucky to have Mr Austin from Funky Science come visit to show us what can happen when different chemicals mix with water. Below are the class preparing for the experiment. Working in pairs it was important to have the correct equipment laid out and to have the exact amounts of the different substances ready before we started. We worked well in pairs and were able to create a chemical reaction with the help of Mr Austin. Below you can see some of the fantastic reactions. Thank you to Mr Austin for a wonderful afternoon. The class are now creating science reports including the equipment used, the method followed and the results found. We have been exploring all things water, magnet and sound related. We have loved experimenting with water finding out about when water boils, melts, dissolves, condenses and evaporates. Below are some pictures of P4 being scientists. We have also worked well as a team showing great communication skills in order to create magnetic games. P4W are very excited to head to the Glasgow Science Centre in March to keep exploring this exciting topic. With Christmas getting ever closer it was time for the P4 Christmas Party. Here were P4W all dressed up and ready to go. We could not wait to get dancing! Below are some pictures from the party of the children having a great time. We all enjoyed some Scottish dancing that we had been practicing in PE. Along with this, we played games of pass the parcel, musical statues and corners where prizes were on offer. A fantastic afternoon was had by all. This week Primary 4 have been running the Christmas Post. Pupils from the whole school can post their Christmas cards at the post office run by P4. For 5 pence per card P4 will then deliver the cards with the money raised going UNICEF. Obviously Crystal the Elf could not wait to help P4W out! In order to run the post smoothly P4W have been learning all about money. We have been learning how to give change from larger notes and understanding the different coins we have. Additionally, we have been learning what a budget is and the importance of sticking to it. We all really cannot wait for the Pantomime this afternoon (14th) and our P4 Christmas Party on Monday 17th. Term 2 has started off with a festive touch in Primary 4W where we have launched our new topic: The Gift of Christmas. The launch began with the popping of a cracker and the children working together to solve the puzzle. Since then we have had a new addition to the class of Crystal the Elf. She is cheeky, magical and here to help the class with their pop up stories that they are creating. Last week we were able to visit Dunblane Library where all the children saw what a pop up book looks like. This gave them loads of ideas that they could use in their books. Since then we have started writing our stories, with the children having many amazing ideas. Soon we will start to create our pop up books. Within the next few weeks will have discussions around what we can give at Christmas with the focus being on the values of kindness, respect, love and fairness. It is not just about the presents we give or receive. P4W have been busy working on creating animations for our topic Ancient Animators. Below are animations that some of the groups created. We do hope you enjoy them. The first term has come to an end in P4W. We have been very busy in class this term. Below are some of our thoughts. We have had a great time working on our Ancient Animators topic learning all about the Romans and how they have impacted Scotland. We have been focused on place value, addition strategies and times table work in maths. We have also enjoyed keeping active in PE and with KM Club. In addition to this we have been enjoying weekly reading practice, learning new words in French and we have been creating mind maps and reports in literacy. We are looking forward to coming back after the October holiday! This term our topic is about Scottish and Roman history and is called Ancient Animators. Below are some pictures of the class problem solving to discover our new topic name. We have been busy learning facts about the Romans in addition to creating Scottish and Italian flags using paint, pencil and crayon. We have had a visit from David Smith from the Stirling Smith Art Gallery and Museum. In this visit Mr Smith talked about Roman artefacts, what the Romans brought to Scotland, Roman forts and life of the Roman soldiers. We were able to take notes to record important information throughout the talk and used our notes to create a summary. We have really enjoyed this topic so far and we all cannot wait to start creating movies and animations about the facts we have discovered! Please follow the link below for P.4 Meet the Teacher information leaflet.